The Lexmark N4000e external print server allows you to easily connect your USB equipped Lexmark laser printer, multi-function printer, dot-matrix, AIO or inkjet to a home or corporate network. The small footprint and affordable price makes the N4000e the perfect choice for environments where space or price is a concern. The N4000e also supports most third-party printers that have a USB port. Easy to set up, configure, manage and update --- Use a utility to install, then use your web browser to access options and manage it. Firmware stored in flash makes it easy to update. Compatible with Microsoft Windows (95, 98, Me, NT 4.0, 2000, XP and Server 2003), Apple Mac OS X (10.2 or later - Apple Zero Configuration compatible), Red Hat and SuSE Linux and HP-UX, IBM AIX and Sun Solaris. An external print server to connect a printer to an Ethernet network using a USB 1.1 or 2.0 Full Speed Compliant USB port, for a 10/100BaseTX Ethernet with RJ-45 connector. Supports Lexmark lasers and selected inkjet printers. For lasers, this includes the Lexmark X215 MFP (print only), T420, E220, E320, E321, E322, E323, Lexmark T520, T522, T620 and T622, Lexmark T630, T632, T634 and Lexmark W812. For inkjets for Windows print only, this includes the Lexmark Z65 Color Jetprinter and the Lexmark X5150, X6150, X6170 and X6190pro All-In-Ones. The Lexmark 2480, 2481, 2490 and 2491 Forms Printers are also supported (except Apple Mac OS). These application services are supported: DHCP, DNS, DDNS, mDNS, WINS, SNMP (industry standard printer MIB), http, lpr/lpd, ftp, tftp, arp, ping, finger and telnet. In addition, these TCP/IP protocols are also supported IPP: Internet Printing Protocol, SLP: Service Location Protocol, NTP: Network Timing Protocol. Service Locator Protocol (SLP) provides key services to your network applications allowing the applications to find the print server in an efficient manner. Network Time Protocol (NTP) ensures that all devices on the network are synchronized with your centralized time server. 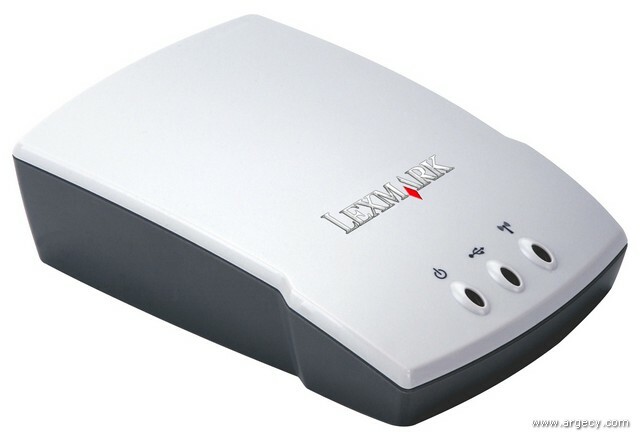 The Lexmark N4050e 802.11g wireless print server allows you to easily connect your USB equipped Lexmark laser printer, multi-function printer, AIO, inkjet or dot matrix to a home or corporate network. The small footprint and affordable price makes the N4050e the perfect choice for environments where space or price is a concern. The N4050e also supports most third-party printers that have a USB port. An external print server to connect a printer to a wireless network using a USB 1.1 or 2.0 Full Speed Compliant USB port. Works with all Wi-Fi certified devices. Easy to configure (via USB interface) and manage --- Uses a wizard-based utility to assist with installation, then a web browser to access and manage settings. Compatible with Microsoft Windows (98 SE, Me, 2000, XP and Server 2003), Apple Mac OS X (10.2 or later - Apple Zero Configuration compatible), Red Hat and SuSE Linux, and HP-UX, IBM AIX and Sun Solaris. With Wi-Fi Protected Access (WPA) personal security, the N4050e offers a high level of access control and allows the printer to connect to a secure network. Works with printers from other vendors (Test prior to purchase). Supports networkable USB-equipped Lexmark laser printers, multifunction printers, All-in-Ones, Inkjet and dot-matrix printers. The Lexmark N4050e external print server is designed to be compatible with any networkable USB 1.1 or 2.0 Full Speed Printer Class Device. Note: Lexmark recommends testing a specific environment prior to purchase of a Lexmark N4050e external print server.